The IWR develops interactive tools that address real world problems such as nonpoint source pollution and water availability. Our suite of decision support, watershed analysis and networking tools transform complex modeling, mapping and assessment into accessible and freely available online applications. Tool development at the IWR stems from collaborative partnerships and innovative research. We design our tools in close coordination with stakeholders and combine leading edge software development, modeling expertise and comprehensive training to provide holistic, practical and effective systems. IWR has provided critical decision support tools that are being used to inform on-the-ground protection and restoration actions that are improving Michigan’s water resources for current and future generations. Below you will find a select list of online tools developed at the IWR. It often takes time to measure and document the benefits of best management practices on the landscape. Social indicators, which examine changes in awareness, attitudes and behaviors, are an alternative approach to demonstrating progress toward water quality goals. 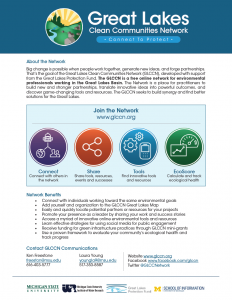 They provide consistent measures of social change within a watershed and can be used by managers at local, state, and federal levels to estimate the impacts of their efforts and resources. 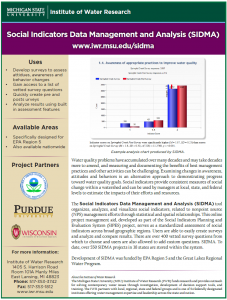 The Social Indicator Data Management and Analysis (SIDMA) system organizes, analyzes, and visualizes social indicators, related to nonpoint source (NPS) management efforts through statistical and spatial relationships. This online project management aid, developed as part of the Social Indicators Planning and Evaluation System (SIPES) project, allows users to create easily create surveys with vetted questions, and analyze and compare results. To date, 244 SIDMA projects in 37 states are stored within the system. 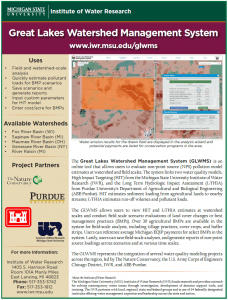 The Great Lakes Watershed Management System (GLWMS) is an online tool that allows users to evaluate non-point source (NPS) pollution estimates at watershed and field scales. Users are able to conduct on-the-fly field scale scenario evaluations of land cover changes or best management practices for run-off volumes, sediment loading and other pollutant loads. 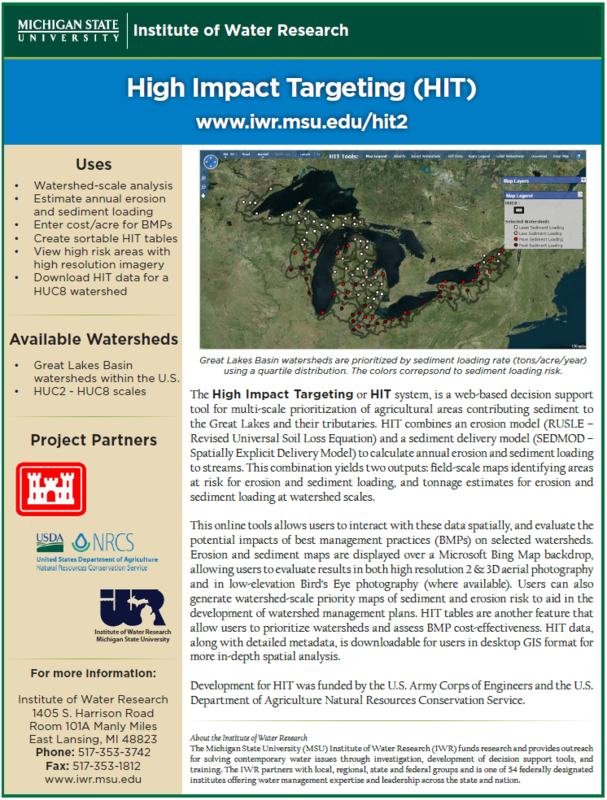 The system links the High Impact Targeting (HIT) model from the MSU IWR with the Long Term Hydrologic Impact Assessment (L-THIA) model from Purdue University’s Department of Agricultural and Biological Engineering. The GLWMS represents the integration of several water quality modeling projects across the region, led by The Nature Conservancy, the U.S. Army Corps of Engineers Chicago District, IWR, and ABE-Purdue. 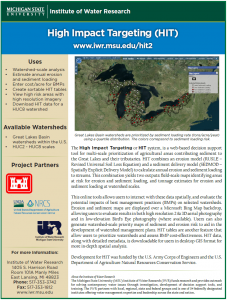 The High Impact Targeting or HIT system, is an online decision support tool for prioritizing agricultural areas contributing sediment to the Great Lakes and their tributaries. HIT produces field-scale maps identifying areas at risk for erosion and sediment loading and tonnage estimates for erosion and sediment loading at watershed scales. This online tools allows users to interact with these data spatially, and evaluate the potential impacts of best management practices (BMPs) on selected watersheds. 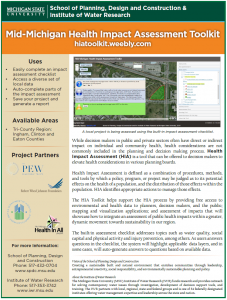 HIT data, along with detailed metadata, is downloadable for users in desktop GIS format for more in-depth spatial analysis. HIT combines an erosion model (RUSLE – Revised Universal Soil Loss Equation) and a sediment delivery model (SEDMOD – Spatially Explicit Delivery Model) to calculate annual erosion and sediment loading to streams. Development for HIT was funded by the U.S. Army Corps of Engineers and the U.S. Department of Agriculture Natural Resources Conservation Service. HIT is currently undergoing maintenance is not available online. If you have any questions, please contact us at iwr@msu.edu. 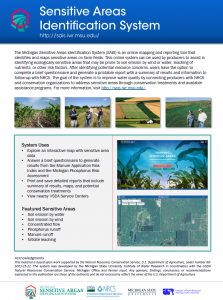 The Michigan Sensitive Areas Identification System (SAIS) is an online mapping and reporting tool that identifies and maps sensitive areas on farm fields. This online system can be used by producers to assist in identifying ecologically sensitive areas that may be prone to soil erosion by wind or water, leaching of nutrients, or other risk factors. After identifying potential resource concerns, users have the option to complete a brief questionnaire and generate a printable report with a summary of results and information to follow-up with NRCS. The goal of the system is to improve water quality by connecting producers with NRCS and conservation organizations to address sensitive areas through conservation treatments and available assistance programs.